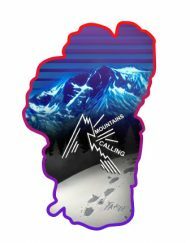 Mountains Calling Logo Sticker… a reminder, the Mountains are always Calling! Mountains Calling Logo Sticker, the mountains are always calling… The sticker comes in black, blue and green. Lake Tahoe. Mountain wear, mountain lifestyle.